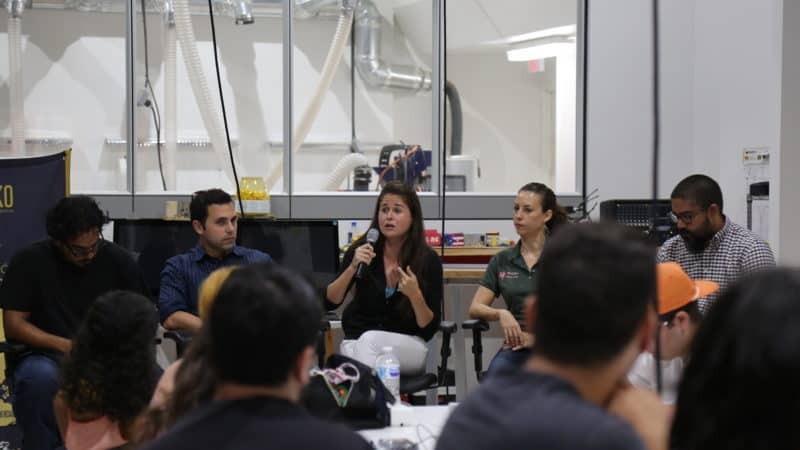 Entrepreneurs and students participated in the Post-Maria Creativity and Business Innovation forum. Photo by: Nicole Ortiz. Maria changed everything; these words are heard frequently after the passage of the atmospheric event in the Island. Therefore, and in line with the new reality faced by the Puerto Rican people, the Center for Collaborative Innovation (Neeuko), held the forum Post-Maria Creativity and Business Innovation with the aim of sharing ideas and creating new collaborative links for economic and social development. The activity was attended by entrepreneurs and businessmen, among them Mariana Reyes (La Junta, Calle Loiza Inc.), Javier Olmeda (Constructo; industrial designer), Javier Malave Bonet (GOTENNA, computer and network engineer), Yari Helfeld (theater company: Y No Habia Luz), Lynnett Cartagena (director of Escuela Puertorriqueña para la Musica), Javier Hernandez (director of the Business Administration department), Miguel Calzada (MECA), and Alejandro Castrodad (100 Resilient Cities). Amid the various experiences shared by the guests, the importance of adaptability, reinforcing de communication networks and shaping solid alliances between diverse sectors stood out. This, they agreed, is the only way to rebuild Puerto Rico with more strength and self-sustainability. Now is the moment to work as a team. If we want to move forward we have to promote unity. It’s not the moment to compete, but to collaborate and find solutions together,” said Javier Malavé Bonet, computer and network engineer. In this new context, the business community needs to rethink their models to adapt to the new reality in the market, they agreed. For this reason, the Business Administration department, the Center for Collaborative Innovation (Neeuko) and the Center for Business Development for Women integrate their experience, resources, knowledge, and services to support entrepreneurs in areas of need. Javier Hernandez, Business Administration department director, stressed the relevance of academic institutions taking a central role in the reconstruction and growth of Puerto Rico. As an educational institution, here in Sagrado we haven’t been exempt of the situation. We have had to rethink our academic and social project to attend the new challenges that we’re facing. We have the opportunity to create an interconnected local economy for the common good, that benefits us all. It’s up to us to create a new country,” he said. On the other hand, Yari Heldfeld of the theater company Y No Habia Luz emphasized the significance of reinventing yourself and using cultural mechanisms to create new commercial and cultural growth centers. “The catharsis of the hurricane allows us to explore new ideas. We need to be aware of what’s happening in Puerto Rico to be more resilient. Given this situation, the cultural work is vital because it benefits society by providing the necessary space to reflect and express ourselves,” said Heldfeld. Likewise, the guests highlighted the importance of considering atmospheric events at times of transforming the country. We have learned that we can’t rehabilitate without considering that this type of climate events can happen again. We need to be ready,” she said.